IPL 2019: With the bat, Kohli has been in sublime form, but as a captain, he has failed. IPL 2019: After RCB slumped to their sixth straight loss in the ongoing Indian Premier League, former English captain has called for the resting of India captain Virat Kohli ahead of the World Cup, later this year. Vaughan feels it is the right time to rest Kohli as he is not in the right frame of mind. This is Kohli’s 9th (3 for India, 6 with RCB) straight loss as captain, which is not good for his morale as he is a premier part of the Indian cricket team. 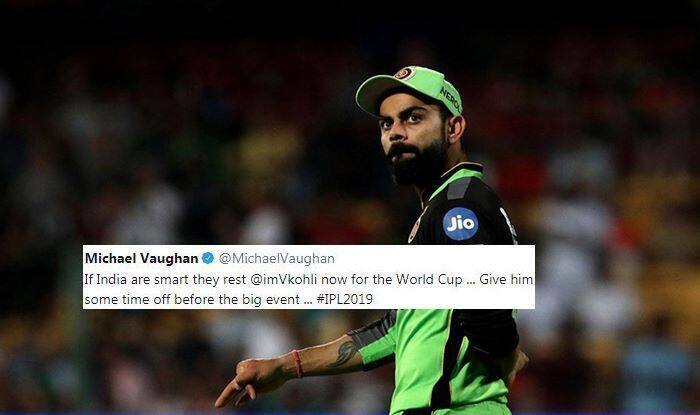 “If India are smart they rest @imVkohli now for the World Cup … Give him some time off before the big event,” Vaughan’s post on Kohli read. Meanwhile, Kohli has not been off colour with the bat as he top-scored in the game with 43 for Bangalore. Even in the last game against KKR, Kohli was the highest scorer for RCB. RCB also joined Delhi Capitals as the franchise with most consecutive losses at the start of the season. “We thought 160 was going to be competitive. Even 150 was about par. It was quite dry underneath and we knew it would be slow. Not as good as the last game. That was exactly the case in the first innings. We kept losing wickets at regular intervals – couldn’t really explode. Even 150 would have been difficult if we had held on to our chances. We need to grab our chances when they come our way. We can’t keep giving excuses every game. We weren’t good enough on the day again. That’s the whole story of our season so far,” Kohli said at the post-match presentation.